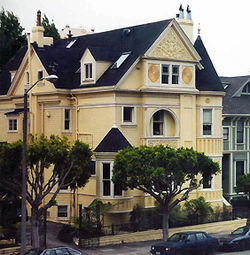 The C. A. Belden House, a Queen Anne Victorian in the Pacific Heights section on Gough Street Between Clay and Washington Streets. The house is on the National Register of Historic Places in San Francisco. The architecture of San Francisco is not so much known for defining a particular architectural style, rather, with its interesting and challenging variations in geography and topology and tumultuous history, San Francisco is known worldwide for its particularly eclectic mix of Victorian and modern architecture. Bay windows were identified as a defining characteristic of San Francisco architecture in a 2012 study that had a Machine learning algorithm examine a random sample of 25,000 photos of cities from Google Street View. Icons of San Francisco architecture include the Golden Gate Bridge, Alcatraz Island, Coit Tower, the Palace of Fine Arts, Lombard Street, Alamo Square, Fort Point, the Transamerica Pyramid, and Chinatown. Included below are summaries of the historical significance of several of these great San Franciscan architectural achievements. At the foot of the Golden Gate bridge is Fort Point, built to protect the Bay from naval attacks. Designed to allow cannons to hit enemy ships at water level, Fort Point is the only one of its kind in the west. It was originally constructed under the leadership of Spanish LT. Jose Joaquin Moraga. Moraga had been sent up from Monterey, about 100 miles south of San Francisco, to build fortifications in the San Francisco Bay in order to secure Spanish control over the whole area. In 1792, he built a Presidio style fort, which had sufficient fortifications, but was clearly not strong enough to truly act as the main defense of the harbor. In 1796, Moraga redesigned the fort and gave it the name, Castillo de San Joaquín. Unfortunately, the fort was built from adobe brick and constructed on sand, meaning that the adobe cracked when one of the cannons was fired and that each winter the Fort would be heavily damaged from the weather. After the Mexican Revolution in 1821, the Spanish were forced to abandon all of posts in California, including the Castillo. Once the fort was abandoned, the Mexican government attempted to maintain it and others of its kind, but the young government simply did not have the resources to do so. All of the forts in California were abandoned by 1835. After California was granted statehood in 1850, the fort still sat unused until 1856, when the United States government allotted 500,000 dollars (about 14 million dollars in today’s money) to install fortifications in California. The people in charge of the fortifications decided to rebuild The Castillo de San Joaquín, but using much more modern materials and building techniques. The fort was built on a granite foundation with masonry walls 12 feet thick. The fort was loaded with weapons and renamed Fort Point. At the time, the fort was incredibly impressive and served as the main fortification protecting the San Francisco bay. It was also the most powerful heavily fortified fort on the west coast when it was built. However, after the civil war, masonry forts of its type were rendered technologically obsolete, leaving Fort Point as simply a testament to San Francisco’s pre-Civil War military might. The Golden Gate Bridge is the most instantly recognizable structure in the city of San Francisco. The bridge spans almost two miles across the Golden Gate, the narrow strait where San Francisco Bay opens to meet the Pacific Ocean, connecting the city with Marin County, California. The concept of a Golden Gate Bridge started with a journalist named James Wilking. Wilking promoted the idea that a bridge across the Golden Gate would bring many benefits. The idea for this bridge had surfaced forty years earlier, but over time people had lost interest, at least until Wilking revived the idea. In 1919, authorities commissioned Joseph Strauss to conduct a survey of the proposed site for the bridge.The main argument in favor of the bridge’s construction was that it would help encourage development north of San Francisco. Strauss became fascinated with the bridge, and began drawing up plans and making calculations for the bridge’s construction. After 10 years of planning, the Golden Gate Bridge Company was formed and Strauss was appointed chief engineer for the project. Engineers Charles Ellis and Irving Morrow also joined the project, with Ellis being appointed as the San Francisco representative. These three men can be credited for the design elements featured in the Golden Gate today. By 1930, the Golden Gate project had gained sufficient support from the public to ensure passage of a 35 million bond to finance the construction of the bridge. Construction of the bridge started in 1933 and would last until May 27, 1937. It was the longest suspension bridge in the world, and was considered a masterful feat of architectural engineering, designed to hold 5,700 lb/ft on its roadway and 2,000 lb/ft on its walkways. An example of the architecture closer to downtown. ^ Prentice, Helaine Kaplan (1987). Rehab Right. Berkeley, California: Ten Speed Press. ISBN 0-89815-172-4. Includes descriptions of numerous different Victorian and early 20th Century architectural styles common in the San Francisco Bay Area, particularly Oakland, and detailed instructions for repair and restoration of details common to older house styles. ^ Wiley, Peter Booth (2000). 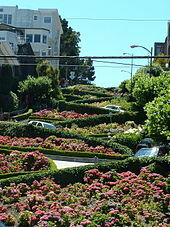 National trust guide- San Francisco: America’s guide for architecture and history travelers. New York: John Wiley & Sons, Inc. pp. 4–5. ISBN 978-0-471-19120-9. OCLC 44313415. ^ Harris, Derrick (10 August 2012). "Big data magic trick: Show me a doorway, I'll tell you the city". GigaOM. Retrieved 21 October 2012. ^ Woodbridge, Sally Byrne and John M. (2005). San Francisco Architecture: An Illustrated Guide to the Outstanding Buildings, Public Artworks, and Parks in the Bay Area of California. Berkeley, California: Ten Speed Press. pp. 19–27. ISBN 978-1580086745. San Francisco Architecture Profiles on individuals and firms practicing during the first 100 years of San Francisco's growth. This page was last edited on 28 February 2019, at 10:23 (UTC).